These two durable Bluetooth speakers are both small and inexpensive, but they have distinct differences as well. Even if you're the type of music fan who looks for the best in audio equipment, small and reasonably priced gear can sometimes have its advantages. For example, if you're going to the park or leaving on a business trip, you'll want something that's easily portable, yet still offers decent audio. And if you're like me, you'll also want a device that doesn't cost too much -- because there'll be a lot less angst if you accidentally leave it in the grass or on the side table in your hotel room. There are a lot of low-cost lightweight Bluetooth speakers out there these days. For this review, I tried out two examples: The Jam Rewind, which retails for $85 and the Braven 105, which sells for $80. Both are small enough to stick into a pack, a bag or even a commodious pocket; both can act as speakerphones; and both offer reasonably good audio. But they're also different in some interesting ways. The Braven 105 reminds me a bit of those products you find on late-night TV that can be turned into three different objects just by pushing here and twisting there. In the case of the Braven, it can become a desktop speaker, a mounted speaker for a bicycle or other vehicle, and a dangling speaker that can hang from a wrist or a backpack. Curious? I'll explain in a moment. The Braven 105 is a round device that measures 3.8 x 3.8 x 1.3 in. and weighs 7 oz. The speaker is waterproof and wrapped in durable rubber. The volume buttons are on the left side, along with a multifunction button that acts as a power/play/pause/answer/hang-up control. A flap in back opens to reveal the micro-USB power port and an Aux-In port. When you first get the speaker, it is attached to a convenient desktop stand. Unscrew and remove the stand, and you reveal a mounting attachment that is attached to the back of the speaker via a wide elastic band. Don't need the mounting attachment? Unthread the elastic band, remove the attachment, reattach the band to the top of the speaker, and you can dangle the Braven 105 from a backpack or belt loop. There's also a place to screw in a tripod, if you want to. Altogether, this is an impressively innovative design. But there's one major hitch: Because the micro-USB port is accessed through the back of the speaker, the only way you can charge the Braven 105 is by removing the stand and the mounting attachment. Which is a real pain, especially if you mainly use it as a desktop device. The back of the Braven 105 after the stand has been removed. The mounting plate can also be removed, and the elastic band looped to the top of the speaker. The speaker comes in seven exotically named colors: Black, Raspberry (pink), Alpine (off-white), Energy (blue), Periwinkle (purple), Sunset (orange) and Electric (green). According to the manufacturer, the battery is good for eight hours of play. While I didn't perform any formal battery tests, it took several days of occasional playing to run the battery down, which would back up the company's claim. The Braven 105 had no problem pairing with my Huawei Nexus 6P smartphone. It uses tones and a small LED in front to signal when the speaker is on or off and when it has paired. It lets you know that a call is coming in by playing "The Ride of the Valkyries" (a tune that seems very popular as a ringtone for audio devices). While the Braven 105 doesn't have quite the volume or the bass of the Jam Rewind, the sound it produced was cleaner and less muddy, especially when it came to vocal solos or more delicate music. 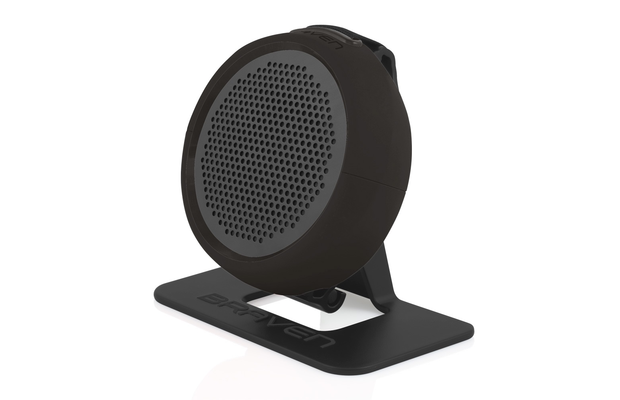 The Braven 105 is fine speaker at a reasonable price, and has an innovative design that lets you hang it, mount it or stand it on a flat surface. If it weren't so difficult to access the power port, this would be a real winner. The Jam Rewind has an interesting retro design: It looks like an old-fashioned cassette tape, with its speakers taking the place of the wound tape. But that's the only thing old-fashioned about it. The 5.8 oz., 5-x-0.8-x-2.5-in. device actually has four speakers -- two in front and two in back. The rubberized case has all the control buttons on top: power on/off; volume up and down; skip forward and back. The play/pause button, which also allows you to take and end calls, is located in the center -- which I appreciated. Too many small speakers have the buttons used for answering calls in some out-of-the-way place, causing confusion when a call comes in. On the right side is the micro-USB power port and an Aux-In port so you can use the Jam Rewind with non-Bluetooth devices. The Jam Rewind uses voice prompts to keep you informed -- a smooth female voice offers handy prompts like "Powering on" and "Ready to pair." When a call is coming in, it says "Incoming call," and if you haven't gotten the message, it follows with loud, old-fashioned telephone ring. The Jam Rewind paired without any problem. The audio was slightly muddy but otherwise surprisingly full, considering the size of the speaker -- it handled the bass notes well, especially for songs with heavy beats. Much of the responsibility for that probably lies with the two back speakers; if you touch them while the Jam Rewind is playing, you can feel the vibrations. Like the Braven 105, the manufacturer rates it for eight hours of playing time, and again like the Braven, it played on and off for several days before it needed to be topped up. 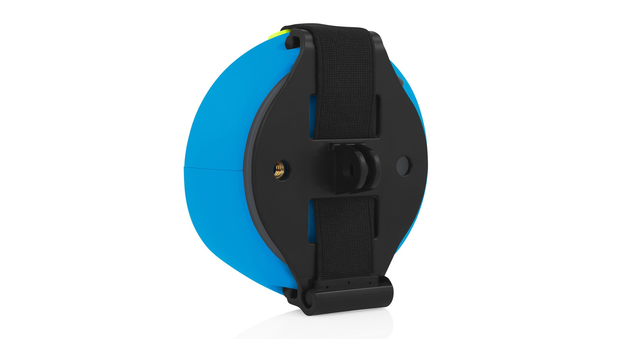 The device is overall dark gray; you can get it with light gray, blue or red highlights. 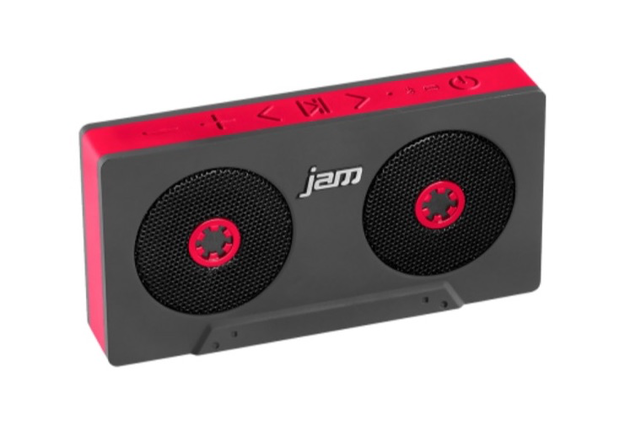 The Jam Rewind is a conveniently small and conveniently designed Bluetooth speaker, with good bass sound. When you're comparing two similar devices, sometimes you find that there isn't a winner or loser -- it all depends on what you're looking for. The Jam Rewind is a fun, lightweight device that produces surprisingly good bass and would suit anyone who wants a casual portable speaker to use with a phone or tablet. The Braven 105 offers a bright, clean sound, durability and a variety of mounting choices, and so would suit someone with an active lifestyle (and who doesn't mind a little inconvenience when powering it up).